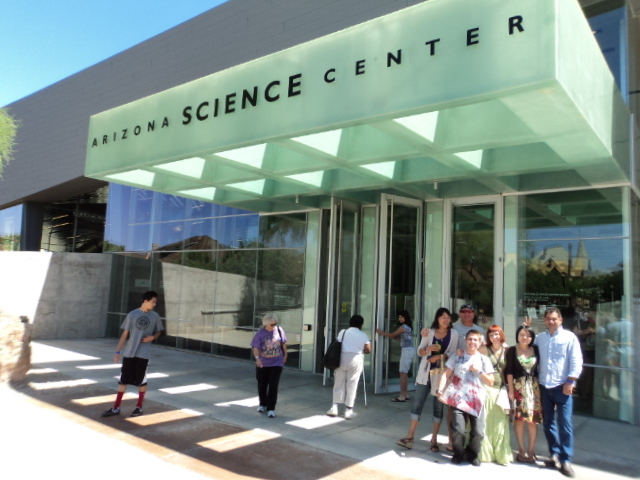 Yesterday a few of us took a field trip down to the Phoenix Science Center to see the Body Worlds Exhibit. Amazing. Have any of you guys seen it? I had no idea they were real bodies! I guess I thought they were replicas, but I was wrong. Seeing the exhibit was especially interesting and helpful since we are all studying Human Anatomy in Massage School (http://asismassage.com/) and we were fortunate to have Joe, the founder of ASIS and one of its owners with us. He did a great job of explaining and expanding on the exhibits and tied them back to what we are studying at school. In the photo below, we have Maki and Michael in the back row and Brandon, Erin, Coyo, and Joe in the front. 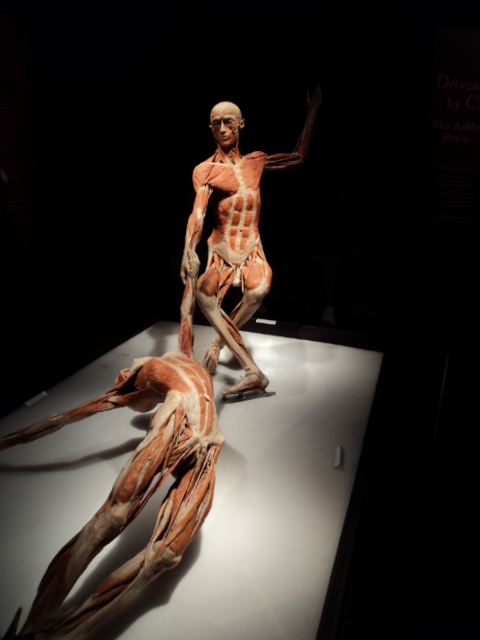 Here is an excerpt describing the exhibit from Wikipedia: Body Worlds is a traveling exhibition of preserved human bodies and body parts that are prepared using a technique called plastination to reveal inner anatomicalstructures. The exhibition’s developer and promoter is German anatomist Gunther von Hagens, who invented the plastination technique in the late 1970s at the University of Heidelberg. 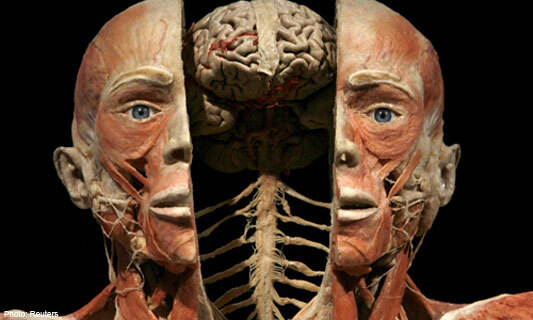 Body Worlds was first presented in Tokyo in 1995. 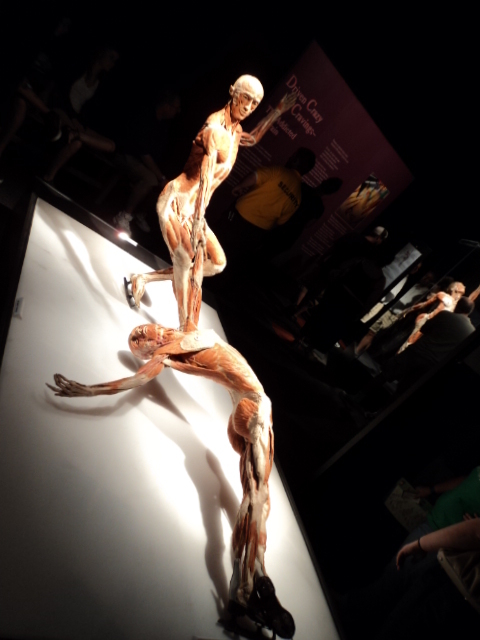 Body Worlds exhibitions have since been hosted by more than 50 museums and venues in North America, Europe, and Asia. The exhibit states that its purpose and mission is the education of laymen about the human body, leading to better health awareness. All the human plastinates are from people who donated their bodies for plastination via a body donation program. 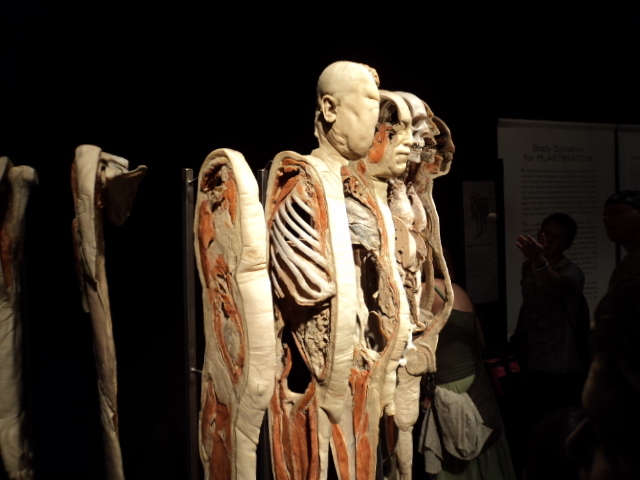 Each Body Worlds exhibition contains approximately 25 full-body plastinates with expanded or selectiveorgans shown in positions that enhance the role of certain systems. More than 200 specimens of real human organs and organ systems are displayed in glass cases, some showing various medical conditions. 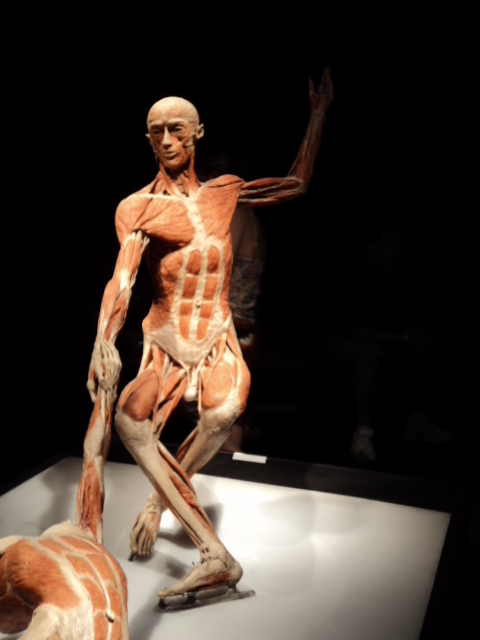 Some of the specimens, such as the Tai Chi Man, demonstrate interventions, and include prosthetics such asartificial hip joints or heart valves. Also featured is a liver with cirrhosis and the lungs of a smoker and non-smoker are placed side by side (along with one from a coal miner). A prenatal display features fetuses and embryos, some with congenital disorders. To produce specimens for Body Worlds, von Hagens employs 340 people at five laboratories in three countries, China, Germany and Kyrgyzstan. Each laboratory is categorized by specialty, with the China laboratory focusing on animal specimens. One of the most difficult specimens to create was thegiraffe that appears in Body Worlds & The Cycle of Life. The specimen took three years to complete – ten times longer than it takes to prepare a human body. Ten people are required to move the giraffe, because its final weight (like all specimens after plastination) is equal to the original animal. Photography wasn’t really allowed, but I couldnt’ help but take just a few photos. The ice skaters pictured below in a Death spiral was my favorite. Take a look. I also took a photo of Sagittal Man, who was left in tact, preserved in plasticine, and was then cut into parallel sections along the sagittal plane. You can see he appears to be sort of pudgy, middle-aged man. This horse and rider was not included in the particular exhibit I saw in Phoenix, but I thought it was worth showing a photo of. 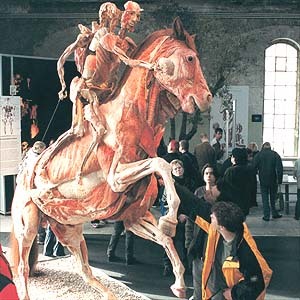 It took over 3 years to complete the horse compared to the 8 months to year it takes to complete a human. So that’s it for the exhibit. 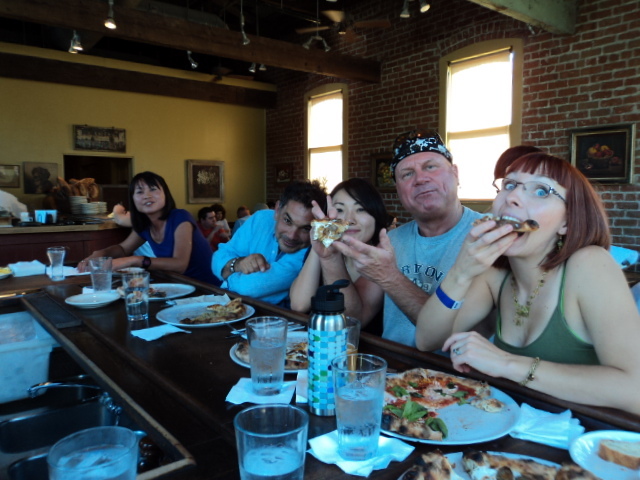 Afterwards, we headed to the nearby Pizzeria Bianco for delicious salads and pizza before driving the two hours or so back north to Clarkdale. OH YES……we went to Atlanta for a weekend just to see this exhibit and it was fabulous. I was shocked at the problems they have had with protestors! In the “bible belt South,” some were particularly verbal and I THINK that prevented the exhibit from being shown at the NC MUSEUM OF NATURAL SCIENCES. For me, this is a peak experience in scientific education. I wonder if you will get to see/participate in an autopsy. Another interesting learning experience about how the body works. So glad to hear from you Lucinda! Thanks for the comment. This is very cool. At first I thought I can’t look and now I would love to see the exhibit. so Margie are you going to massage school??. I really wanted to do that but never followed through on it. Now I have hopes of learning to rub jusst arms and legs of older person’s like myself, on a volunteer basis.